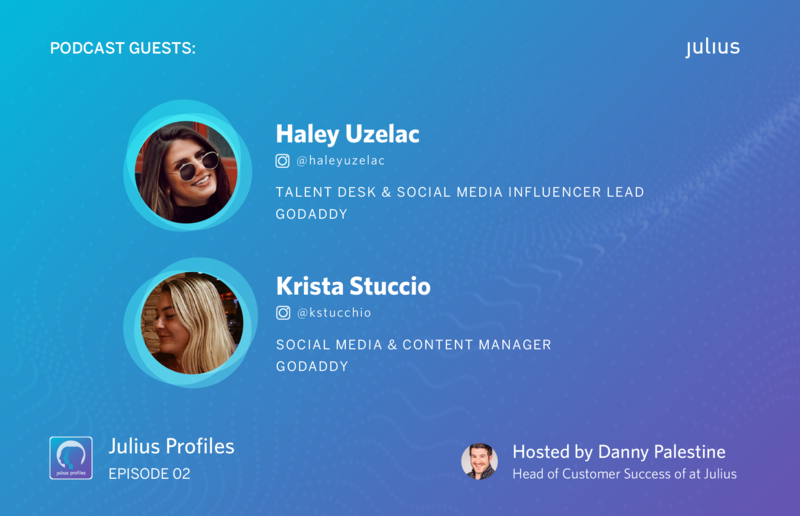 In the second episode of the Julius Profiles podcast, we spoke to Krista Stucchio (@kstucchio) and Haley Uzelac (@haleyuzelac) from GoDaddy about Wearing Different Hats when executing an influencer marketing campaign. Haley is the Talent Desk & Social Media Influencer Lead at GoDaddy, and Krista is their Social Media & Content Manager. What makes this episode’s guests especially interesting is that both are influencers themselves. Krista runs a successful foodie instagram, while Haley maintains a fashion blog. On top of their experience, their gravitas and humorous personalities speak for themselves. And better yet, they’re friends from way back in high school. Danny began the conversation by suggesting that influencer marketing campaigns have a lot of moving parts that force marketers to wear several different hats to pull it off. Since both Krista and Haley are influencers themselves, they have had to juggle a multitude of competing responsibilities and expectations in their influencer marketing careers. As Krista and Haley revealed, managing your time is key to being successful in the industry. They discussed the different ways they kept track of their workloads, from physical planners they write in to cloud-based task management app, Wunderlist. Organizing asks, demands, and more is just one part of being a successful marketer. Managing time and staying on top of priorities is a different beast. And learning how to be strategic is what makes Haley and Krista’s job at GoDaddy so interesting. Danny agreed, citing how important it is for him to build relationships with his co-workers as well. He then shifted gears, asking how Krista and Haley apply these skills to their influencer partnerships. And industry knowledge only goes as far as you can communicate it. “I think it’s kind of a mix of knowing the space to also just understanding how to communicate with a human being, even if you are doing it through the internet,” said Krista. For Krista and Haley, balancing work and life as an influencer is a huge undertaking. Their side-hustles, as Danny describes them, are almost as demanding as their full-time jobs. Juggling responsibilities and staying persistent highlights the importance of “me time” and decompression. “Things can get a little bit crazy but I’m pretty organized on my phone, I obviously have a lot of photographs, I actually have a folder and it’s my food archives. It’s funny because people think I’m eating these things on that actual day that I post. I’m like, no, I didn’t have this elaborate brunch on a Tuesday morning.” To Krista, being an influencer is akin to wearing the community manager hat. Haley and Krista’s experience as influencers translates well to their jobs as marketers. But how does that alter their perceptions of the influencers they work with? And moreover, how do they advise influencers to achieve success? For one thing, both Haley and Krista emphasized the importance of structure and routine in their lives. They cherish corporate work in that they generally know what to expect from their daily routines. And they expect the same predictability from their influencer partners. As Haley described it, “when I’m vetting influencers and I’m reaching out, I always look for fast responders because influencer marketing can change on a dime.” To Haley, slow responders can make or break a campaign when objectives or deliverables suddenly change. Beyond that, influencers who know their brand and know the industry have a leg up on the others. They make for good partners whose expectations can be adequately managed. And once the legal process is underway, “It’s like a little volleyball,” said Krista. “I’m just sitting here watching like table tennis or something,” adds Haley. While lawyers on either side deliberate, marketers still have to do their jobs. Staying on top of influencers amid the legal process sometimes requires “tough love,” as Krista says. Though Krista and Haley often lean on their lawyers, they also try to foster relationships with influencers throughout – and after – the campaign process. GoDaddy maintains a team of influencers they refer to as the “Bespoke Tribe.” Not only does it include influencers they presently work with, but also people they engage with on social media, whether they’re customers of GoDaddy or just fans of the brand. Fostering these relationships, according to Haley, is vital to success. Treating them with experiences, sending them gifts, or inviting them to events helps smooth the process, even when they’re not actively running a campaign. How many hats must an influencer marketer wear? Danny asked the guests what a marketer has to do to find success with influencers? And those caveats can range from the nuances of one influencer’s audience to the relative cost of using another influencer. At GoDaddy, Krista and Haley have worked with a wide variety of influencers, from macro influencers with massive followings to micro influencers who are just dipping their feet into the world of influencer marketing. Building relationships, educating higher-ups, and executing a campaign require a marketer to wear all of these different hats to address the sea of caveats. The final piece of the puzzle, then, is helping consumers understand influencers. In light of the Fyre Festival fallout, the public image of influencers is skewed. Many see them as “hot models on a beach,” rather than the storytellers they often are. The Fyre Festival, according to Haley, is how her “parents see influencers,” but she brings it back to the audience. The consumer experience with influencers, as Haley describes it, comes down to who is following the influencer. The conversation concluded with lots of laughs and smiles, as Danny commended their willingness to take on more responsibilities at work. With so many different hats to wear, it’s sometimes difficult to plan ahead. But not for Haley and Krista. GoDaddy is always looking out for “hustlers” on social media who tell awesome stories and share compelling content. Even if they aren’t GoDaddy customers, they’re happy to share unique and interesting content on branded channels. To sum it up, Haley described their careers as, “We’re essentially buying new hats and we are stocking that hat cabinet.” And the cabinet grows with every innovative new project they take on.